Rally-O is an upcoming dog sport. 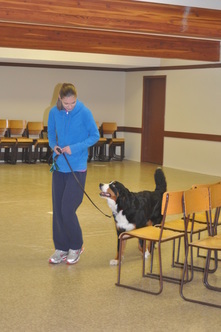 A mix of Obedience and Agility, this class is suitable for dogs of any age! Come and play with your dog while teaching them great focus skills. Want something FUN to do with your dog? Want to create a better bond with your best friend? Then the Tricks class is for you! This class is acceptable to anyone, whether you compete in dog sports or just want to have fun! We will be working towards your Novice and Intermediate Trick Dog titles.